What if you approach, or are approached by a structured settlement purchaser willing to purchase your structured settlement payment rights, but you only want to sell portions of certain payments at this time while keeping the rest of those payments to yourself? 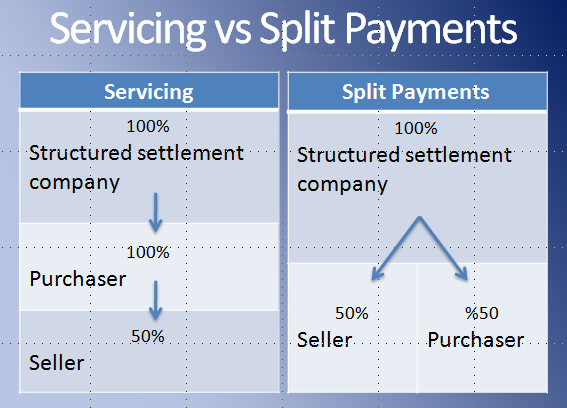 One potential solution is "split payments," as described here. But split payments, was explained at length, is a problem when meeting objections by the structured settlement obligor or annuity issuer, and the law in many states leans on their side barring the dividing of payments without their consent. A possible way to get around the issue and sell parts of payments when the annuity issuer is opposed to split payments is structured settlement Servicing. Servicing is the practice of assigning the rights of your full payments to a structured settlement purchaser who will then "service" the parts of payments to you that you don't want to sell. The servicing company (structured settlement purchaser) will replace you as the recipient of the factored payments directly from the company that is sending the periodic payments. The company will then keep to itself the part of each payment that it purchased from you, and it will send you the remainder of the payment that you didn't sell to you. This way, you are still selling only parts of your payments to the structured settlement purchaser, but because the purchasing company is the only recipient, and the structured settlement obligor doesn't have to split the payments and separately to two different payees, it is not barred by the anti split-payment provisions of structured settlement purchasing statutes. Let's say, a personal injury claimant is scheduled to receive monthly payments in the amount of $1,500 each month for the next 3 years agrees to sell $500 of each of these payments to an interested structured settlement purchaser while keeping the remaining $1,000 of each monthly payment to himself. In order to make this division possible, the monthly payments would have to be split and the annuity issuer would have to send out two separate payments each month, one in the amount of $500 the structured settlement buyers and one in the amount of $1,000 to the original payee. However, since the annuity issuer may object to the split payments, a servicing agreement may be proposed. Following the Servicing agreement, the annuity issuer will keep sending out only one single payment each month, in the full amount of $1,500, to the structured settlement purchasing company who will then "service" the payee's portion in the amount of $500 each month and remit it to the payee while keeping the transferred portion of each monthly payment in the amount of $1,000 to itself. The split service payment issue will now be solved. However, servicing agreements may have its own potential issues and annuity issuers as well as structured settlement purchasers may object to servicing solutions, as follows. As a result of the servicing, the annuity issuing company is assigning the responsibilities to the structured settlement buyers to keep untransferred portions of the payments to the original payee. The annuity issuer may argue that by ordering it to assign responsibilities to the structured settlement buyers, it is being compelled to unwillingly enter into a contract with a new party it did not have previous relations with. The company may further argue that as a consequence of the servicing arrangement, it may be exposed to litigation and new costs and responsibilities in case the servicing company fails to transfer on the remaining portion of the payments to the payee. In actually, the annuity issuer will likely not be held liable for any consequence in result of the servicing agreement, since the payee is releasing it from all liabilities by entering the transfer and servicing agreement. Neither is the annuity issuer likely to be compelled by the court to pay any costs or expenses related to consequences arrising from the servicing company's failure to remit the payment portions due to the payee. It would have been much more convenient for a structured settlement purchaser to just receive its part of each payment while the settlement holder continues to receive his own part in a separate payout by the annuity issuer without carrying the burden of servicing the rest of each payment to the payee throughout the whole period receiving the payments that may last for years. After all, the servicing is an extra responsibility one may prefer not to assume if possible. Because of resistance of annuity issuers to split payments and the law preventing courts from forcing the issuers to do so, structured settlement buyers may, however, be left with no other option but servicing if they wish to buy out and own parts of payments. In accordance with a servicing arrangement, it will be obligated to split each factored payment and send out the owed portion of it to the claimant for the whole time of the agreement. If it fails to issue payments, the structured settlement buyers and servicing companies will be subject to lawsuits and associated costs and fees and unable to transfer liabilities back to the annuity issuer who was released of responsibilities. Finally, the question is if the servicing process is in the best interest of the payee which is a major consideration in each structured payments proposal. The potential negative consequences of a servicing deal to the claimant is that liabilities of strong and high-rated annuity issuing companies may be transferred under a servicing agreement to factoring companies that may not share equal financial strength and security. What happens if a servicing company goes bankrupt or ceases to remit the untransferred payment portions to the payee for whatever other reason? The annuity issuers will likely be held free of any responsibilities and may turn down questions and claims by the payee related to the payments since it has been released of its liabilities at the time of signing the servicing agreement. A lawsuit against them may be unsuccessful for the same reason, and litigation costs and administrative charges may not be at their expense. For all these considerations, a judge may weigh in on a servicing petition whether it is in the payee's best interests that are to be protected by the court. Looking for a Structured Settlement Purchaser to Sell payments?